Buds are forming, bloom will be here soon and bees are starting to arrive. What a better time to answer your bee questions than now! Ask the experts is a series I am writing to get some of these hard to answer questions answered. I opened the discussion up to you guys and asked your input on questions pertaining to bees. These are just a few of the questions I have been asked. Have more? Ask away and I will try my best to find an expert for your questions! Mike Mulligan is the owner of Glory Bee, the beekeeper we choose on our farm to contract with for our pollination needs. Mike a good family friend so it was easy for me to find you a beekeeper to answer those stunning questions. 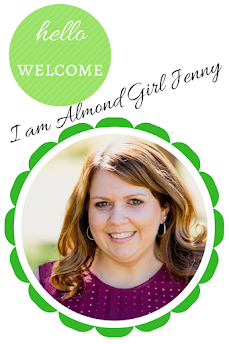 Almond Girl Jenny (AG): Can you give us a brief introduction of your farm/ company? 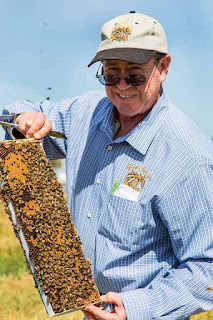 Mike Mulligan (MM): l got my start in the bee business back in 1975 after I graduated from UC Davis when Hubert (Jenny's grandfather-in-law) offered to start me off. He offered me 400 beehives, a new 1976 Ford truck, misc. beekeeping equipment, and an old shop building. He had a few of his farm employees help me with building new bee boxes and your father-in-law even helped me a few times moving bee hives. I lived in an old shack for several years nearby. And I was so surprised when Hubert told me that he wanted to sell me the bee business after just two years of working for him. AG: What was beekeeping like back then? MM: Back then, there were huge acreages of cotton and alfalfa in the Wasco area, which provided summer honey production for the bees. 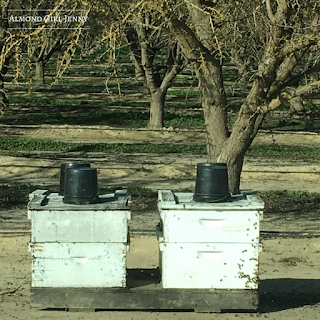 I rented the bees out to almond farmers for pollination for $9.50 / hive the first year. (it's now close to $200/hive, 37 years later). I took the bees up to the Lindsay area for orange honey production after the almonds, then on to seed alfalfa pollination for several years at Boswell Farms. 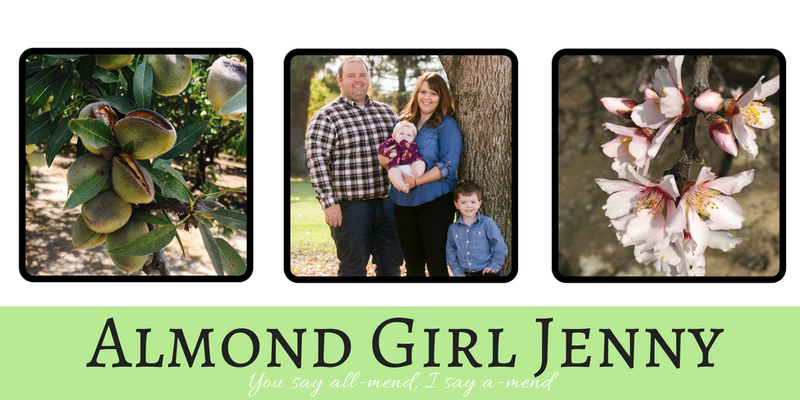 AG: How is your family involved in your farm? MM: I married Susan Zachary from Shafter in 1987, and she really got the business, billing and office work organized and she became a great business partner as well as wife and super-mom. The business eventually grew to approximately 7500 hives today with about 12 full time employees. I had several young men from a Wasco family start working for me and they became the backbone of the business. 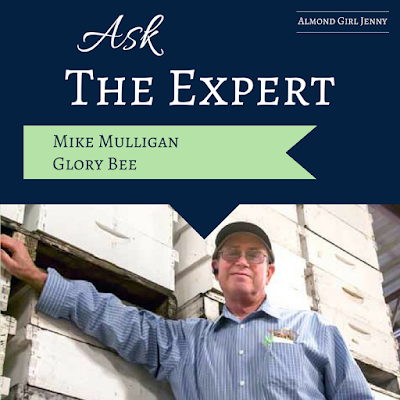 Almost the entire family has worked for Glory Bee Co thru the years. At this time, none of our seven kids show much interest in the family business. It is a very demanding business, requiring long hours and backbreaking work, often in extremely hot weather. That doesn't seem to interest them. AG: Can you give us an insight into care for bees during the summer? MM: We have started trucking most of our hives out of state, to North Dakota and South Dakota, for summer honey production in the last few years, as cotton and alfalfa have declined drastically in Kern County. This move has presented many new and challenging changes to try to adapt to. Our "beekeeping" year revolves around almond pollination now days. 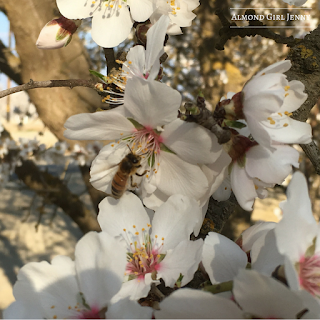 Almost all commercial beekeepers truck their hives to CA for the almond bloom. AG: What is the hardest part of maintaining the colonies? MM: Somewhere, around 1995-2000, parasitic mites of honeybees spread into the US and boy did that shake things up across the beekeeping industry in the US. One in particular, the Varroa mite, has become the source of all the related problems related to CCD (colony collapse disorder). It is very difficult to control this pest efficiently without damaging the bees, especially the queen bee. It's difficult to produce a food product (honey) and use miticides without contamination problems. All the other problems related to running a farm in CA; Workman's comp, DMV, insurance, CAL OSHA, they have been, and are still scary. Now that you are a little more educated on bees, maybe you will look at the jar of honey a little different. Have more questions for Mike and other industry experts? Ask away! Shoot me a message in the comments below, send me an email or look me up on social media. Did you miss the first Ask the Expert post from Matthew Haddon, Sierra Gold?